Welcome to the website for Beer Day Britain, the UK’s national beer day annually on June 15th. 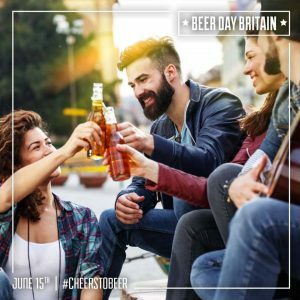 Celebrate Britain’s national alcoholic drink and spread beery love throughout the land by joining the National Cheers To Beer at 7pm (19.00h) on June 15th as millions of people across the country raise a glass, say ‘Cheers to Beer’ and post a message on social media with the hashtag #CheersToBeer. Find out more about Beer Day Britain and how can you join in. Beer has been the national drink of Britain for millennia (before it existed as the UK). Heather ale is most likely to have been the first beer consumed on these shores. It was brewed in Scotland from at least 2,000 BCE by a pugnacious warrior tribe known as the Picts. Over centuries waves of invaders – Angles, Saxons, Jutes and Vikings – brought the habit of drinking their favourite libation with them which served to reinforce native Britons’ already long held veneration for beer. What is Beer Day Britain? © 2019 Beer Day Britain. All rights reserved.